When the media scares the public with unproven theories. Of the three macronutrients – protein, carbohydrates, and fat – the latter is easily the most misunderstood. Oil, grease, fatty acids - what does it all mean? Does it clog arteries? Which fats are healthy? Americans these days have learned to be fat-phobic. In this Information Age, big food companies, the media, advertising and even faulty government advice all play a role. We’ve been taught that fat is bad; heck, the very word “fat” describes an essential macronutrient and humans being overweight. Kind of makes it confusing. Fats from animals and vegetables have been a part of human history for a really long time, but modern science can now tell us that fat is essential for our health; in fact, fat and cholesterol make up the building blocks of our cell membranes and hormones. Nearly 60% of the brain is made up of fat. So, we know that fat is good for us, but which fats are best? Understanding the types of fat available will help us make better choices. This is the most demonized of the fats, but without good reason. Saturated fats have the most stable fatty acids because every carbon bond in their chains is paired with a hydrogen atom. This makes saturated fat solid at room temperature. And more importantly, free radicals can’t cling onto it. Coconut oil and palm oil (tropical fruits) are composed mostly of saturated fat. Animal fats have a lot of saturated fat too, like butter which is about 50% saturated fat. Pig fat also has saturated fat, but is actually composed mostly of monounsaturated fat. Monounsaturated fatty acids have one double bond - one “bend” in the chain. They are liquid at room temperature, but generally safe for moderate cooking. Since they have a bend in their chains, they are prone to free radical damage and should not be exposed to high heat. Extra-virgin olive oil has about 75% monounsaturated fat and Canola has about 60%. They’re also found in avocados and nuts. But there’s another story to distinguish these. See, most oils also contain polyunsaturated fatty acids, which is the next fat on the list. These fats have more than one double bond in their chain, and are much more susceptible to going rancid and oxidizing with free radicals. Since they aren’t as stable as saturated fats, they are always liquid, even in the refrigerator. Foods with a decent dose of polyunsaturated fats can be either really high-quality or really, really damaging to your health. Weird, right? On one hand, you have cold-water oily fish like salmon and sardines, seaweed, flax and nuts, and on the other hand you have grains, corn oil, safflower oil, sunflower oil, cottonseed oil, soybeans and peanuts (just to name a few). Why are some good and some bad? Well, it’s all about balance. What the heck are essential fatty acids? Polyunsaturated fats can be further broken down into Omega-3s and Omega-6s, and these are called essential fatty acids because our bodies can’t produce them; we must obtain them from food. The important part is the ratio. Studies show that traditionally, humans had a 1:1 ratio of O6:O3, and the modern Western diet is up to about 15:1 (some say 30:1). That is a huge imbalance. Bringing your ratio down to as close as 1:1 as possible has shown in studies to reduce the risks of basically everything, like obesity, cancer, inflammation, cardiovascular disease, asthma and arthritis. 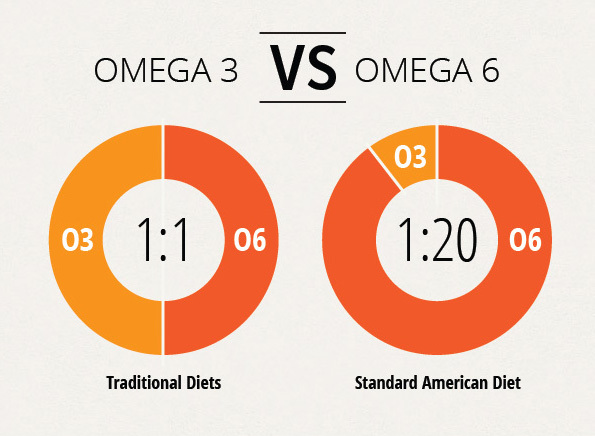 So which fats have good Omega 3:6 ratios and which don’t? The best options tend to be naturally-occuring sources. Take butter; it has a ratio of about 1.6. Soybean oil is around 7. Corn oil? 46. And cottonseed oil? 260! The biggest contributers to our increasingly unhealthy diets is processed foods. Often they contain cheap and industrialized “food” products - not real food. All those yellow “vegetable” oils in grocery stores (corn oil, safflower oil, sunflower oil, cottonseed oil, soybean oil and peanut oil) show up in most packaged foods and fast food restaurants, precisely because they are cheap. They just so happen to be the worst fats for your health. Well, except for trans fats. You’ve probably already heard the news, but just in case, there’s one more type of fat you have to watch out for. Trans fats were created in a laboratory, by blasting hydrogen atoms at unsaturated fat, adding a hydrogen atom in the fatty acid chain, making an unnatural substance that your body doesn’t understand - like putting antifreeze in your gastank. The obvious culprits are margarine and shortening, but you can also find trans fat in things like pastries, donuts, muffins, cookies, cakes, frosting, chips, and most fried foods like fried chicken and french fries. Even highly processed oils (like Canola) have a small amount of trans fat due to the extreme industrialization, but the FDA allows the packaging to say 0g when it’s less than 0.5g - in one serving. If you see anything like “hydrogenated” on a label, set it down and slowly back away. So what exactly is healthy fat? First of all, stay away from most packaging that says “low-fat” or “non-fat” - it generally means fat was removed and fat and other crap was added in to replace it. When in doubt, stick to natural fats, and minimally-processed at that. Fats from pasture-raised animals like butter, lard, tallow and duck fat are great for cooking and baking, and it’s not industrially processed. Coconut oil and olive oil are staples for every real food kitchen. Salmon, sardines, trout, herring Coconut milk, avocados, flax, walnuts, macadamias and almonds contain healthy fats, too. The bottom line is we need fat in our diets. When early American pioneers heading west could only manage rabbits for meat, they encountered extremely low-fat meat. With such a low amount of fat in their meals, they still felt hungry after eating it, and ended up very ill. “Rabbit starvation,” as it was known, is a symptom of not having adequate fat in the diet. We need fat for energy and helping absorb nutrients. Eating a tomato without olive oil makes you absorb less of that tomato’s nutrients. Same with potatoes and butter. Choose full-fat yogurt and milk. It not only tastes better, it IS better for you. Win-win.